At RHRLI, we’re proud to offer the most state of the art treatment available for hair loss and thinning hair. It’s called the ARTAS® System and it uses robotic technology to transplant healthy donor hairs to where they’re needed. The precision of the ARTAS® System gives those looking for a permanent solution to hair loss a healthy head of hair. But ARTAS® is relatively new technology and we know some patients who’ve had other types of transplants and are still dealing with a number of the effects of the procedure. Scalp Micropigmentation basically involves tattooing thousands of tiny ink spots that look like hair follicles onto your head, according to GQ. But that’s a simple explanation. There’s a lot that goes into this form of cosmetic pigmentation. Tiny needles are employed in a way to mimic the pattern of hair that’s been closely cut. The needles are added to use colored pigment that matches the color of the patient’s hair. They’re computer controlled micro-fine needles which create tiny pigmentation dots about 0.1mm in size. One common issue for patients who’ve received older procedures such as Follicular Unit Transplantation (FUT) is scarring. FUT, also known as strip surgery, involves harvesting strips of skin which are removed from the scalp. Unlike ARTAS®, FUT is an invasive procedure that requires surgical incisions and leaves a scar on the donor area. Patients with these scars often can’t wear short hairstyles. Scalp Micropigmentation is often used to make the scar less noticeable. In addition to covering surgical scars, the procedure is often used for patients who have limited donor hairs and can’t receive a transplant or those who’ve had previous transplants and have depleted their donor area. The procedure usually involves three sessions spaced over 2 to 3 weeks. The three sessions are necessary to see how the patient responds to the coloring and how the scar tissue responds. Adjustments will be made during the other two sessions. The procedure takes 2 to 4 hours per session or longer if you’re looking to cover strip surgery scars. It’s not considered to be a painful procedure, and it takes 3 to 4 days to recover. No hair washing, swimming, or extreme workouts are permitted during those days and the scalp isn’t permitted to get wet. If you think scalp micropigmentation be right for you, RHRLI will consult with you about your options. We have Marianne Morrison, a Scalp Micro Pigmentation practitioner on our staff. Marianne has a background as an Emmy-nominated entertainment makeup artist. She began learning about scalp micropigmentation when she realized a close friend who had received a hair transplant procedure had a long scar. 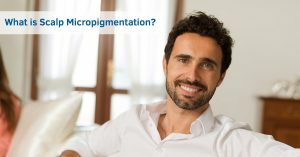 Patients interested in camouflaging scars or patches of the scalp without hair, or if they want more information on a permanent solution to hair loss or thinning hair can consult with RHRLI about either scalp micropigmentation or the ARTAS® System. Contact us today to learn more about the procedure.